Day 269 / Hat 269: Black, baseball-style cap with black, oval-shaped embroidery on front of two crossed light blue paddles against a black background with a white border. Additional embroidery on back reads: "Blue Paddle Bistro" in light blue. 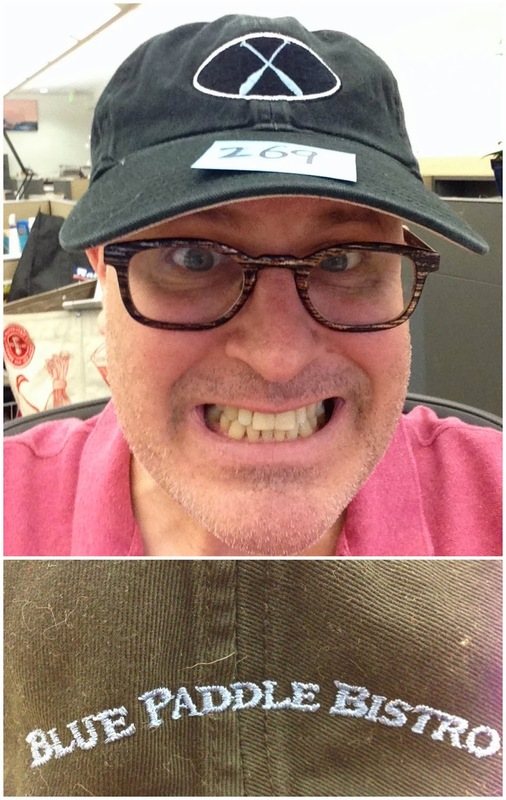 This hat was plucked at random from the SJTBOH this morning and the logo and name reference a restaurant on Route 2 in the village of South Hero, Vermont (slogan: "Love many, trust a few, but always paddle your own canoe"). For those of you who were tromping about Burlington back in my college days who might remember JM Noonies Deli, apparently the Blue Paddle traces its origins back to that eatery -- and the women behind it -- Phoebe R. Bright and Mandy Hotchkiss. Located on a peninsula that juts out into Lake Champlain, the town of South Hero takes its name from (and was once once owned by) a couple of my personal heroes -- Ethan Allen and his brother Ira Allen (the latter of whom also founded UVM). "The Town of South Hero, located in Grand Isle County in Northwestern Vermont, lies on the Southern half of South Hero Island in Lake Champlain. The area which now encompasses South Hero, Grand Isle, and North Hero was given to Ethan and Ira Allen on October 27, 1779 as a reward for their services to the state." In fact, according to most accounts, it was after a visit to South Hero ("with one of his workers to visit his cousin, Ebenezer Allen, and to collect a load of hay," notes Wikipedia ) that, on the return trip, the great agitator apparently suffered an apoplectic fit, fell unconscious and died a short time later -- on Feb. 12, 1789. A hat-tip to sister Sue and a hearty "huzzah" to the brothers Allen!